I love the bright, colourful decorations to be found on canal boats in England. I paint these patterns onto all sorts of things, which I sell through mail order or via my Canalia website. I have been painting canalware for around 10 years and prefer to paint individual pieces rather than produce vast quantities of identical articles. Many of my pieces are one-offs, some being antique or historic artefacts, others being bought new for the purpose of decoration. Each piece is hand-painted with care to a design suggested by its shape or function. The traditional motifs of roses and castles date from the middle of the 19th century and were originally used to decorate the narrow boats found mainly on the canals of the midlands and the south. Included somewhere in the design of each piece I paint is my painter's mark, a ladybug, and the article is then given a coat of varnish to give it a long-lasting protection. I paint to commission as well as for general sale. The castle scenes normally depict a rather romanticised landscape, which includes distant hills, a lake, a river crossed by a bridge, as well as the castle itself - which were of varying architectural styles, depending on whom the artist was. Both the flowers and the landscapes were highly stylised, and painted with a minimum of brush-strokes to achieve the desired effect. Much of the painting was done by craftsmen employed in the boatyards, although some of the owner-boatmen (known as number one's) did their own painting and sign-writing. 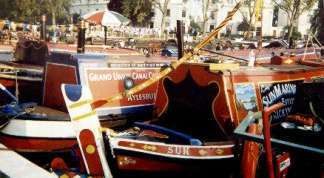 Narrow boat art has survived despite the loss of the trading boats on most canals, and is now finding new roles decorating modern pleasure boats as well as objects for use or display in the home. It looks well adorning garden pots and planters, as well as everyday objects such as cruets and candlesticks, jugs and coffee pots.